Using flexible organic circuits and specialized pressure sensors, researchers have created an artificial "skin" that can sense the force of static objects. Furthermore, they were able to transfer these sensory signals to the brain cells of mice in vitro using optogenetics. 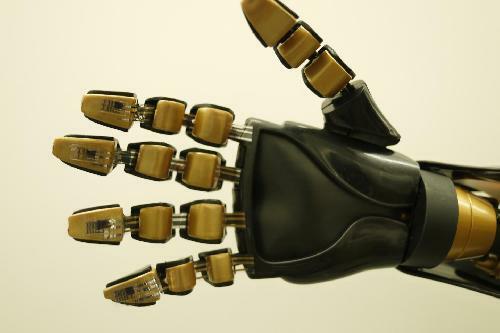 For the many people around the world living with prosthetics, such a system could one day allow them to feel sensation in their artificial limbs. To create the artificial skin, Benjamin Tee et al. developed a specialized circuit out of flexible, organic materials. It translates static pressure into digital signals that depend on how much mechanical force is applied. A particular challenge was creating sensors that can "feel" the same range of pressure that humans can. Thus, on the sensors, the team used carbon nanotubes molded into pyramidal microstructures, which are particularly effective at tunneling the signals from the electric field of nearby objects to the receiving electrode in a way that maximizes sensitivity. Transferring the digital signal from the artificial skin system to the cortical neurons of mice proved to be another challenge, since conventional light-sensitive proteins used in optogenetics do not stimulate neural spikes for sufficient durations for these digital signals to be sensed. Tee et al. therefore engineered new optogenetic proteins able to accommodate longer intervals of stimulation. Applying these newly engineered optogenic proteins to fast-spiking interneurons of the somatosensory cortex of mice in vitro sufficiently prolonged the stimulation interval, allowing the neurons to fire in accordance with the digital stimulation pulse. These results indicate that the system may be compatible with other fast-spiking neurons, including peripheral nerves.